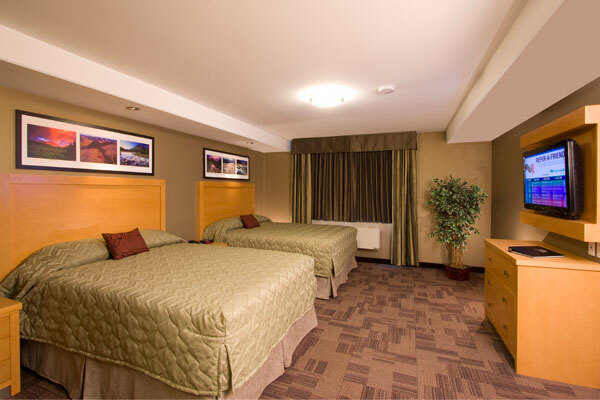 The Woodlands Inn & Suites features 202 elegantly decorated guestrooms and suites. Indulge in the feel of the crisp sheets, plush pillows, and soft linens on our new Restwell President II pillow top mattresses and black out drapes to ensure a restful sleep. 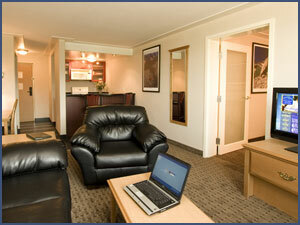 You can also enjoy our complimentary high-speed internet, telephone voicemail, and in-room coffee. 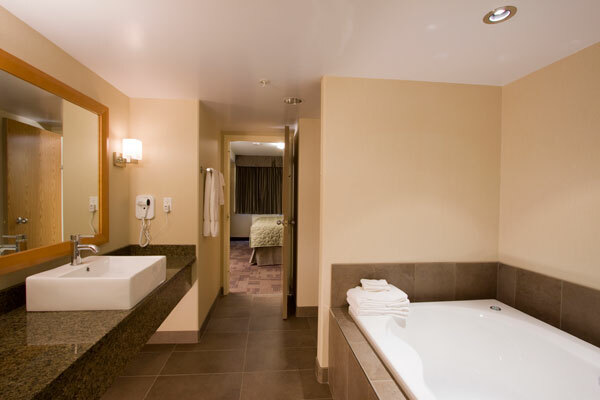 Our Executive rooms and suites feature complimentary bath robes, bottled water, business desk with second phone, professional office chair, wireless internet and a 32” LCD flat screen TV. 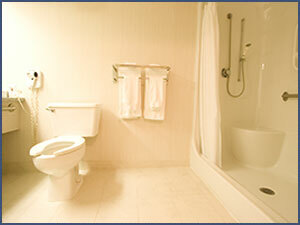 For more information on our hotel amenities, please visit our Amenities page. 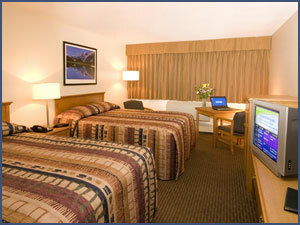 The Woodlands Inn & Suites offers monthly and extended stay rates for all of our guest room types. Please contact our friendly front desk staff for further details. Our Superior Rooms all feature 2 queen beds and are perfect for a family, couple, corporate crew or group stays. 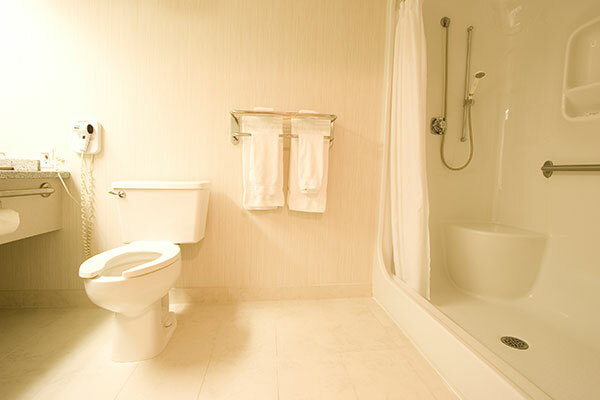 These rooms include all of our standard amenities. Our Executive Floor consist of rooms with 1 King bed, a fridge, microwave, iron, and ironing board, large working desk space, executive office hair, and a second phone. All rooms on this floor offer fine details including complimentary water, in room coffee, complimentary local calls, flat panel LCD TV, use of bath robe and high speed internet. 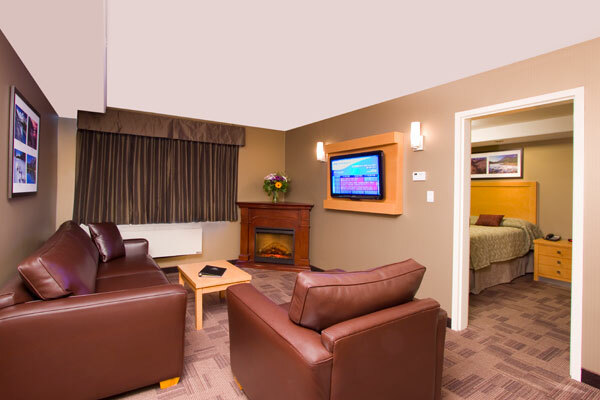 Our Executive Business Suites are great for families or business use. They feature a separate bedroom with 2 Queen beds and glass privacy doors, dresser, fridge, microwave, 30” LCD TV, coffee station, and complimentary use of bath robes. The living rooms boasts a black tile wall unit with a fireplace and a 32” LCD TV, leather furniture, working desk with office chair, second phone, dining table, free wireless internet, modern and well light work spaces. 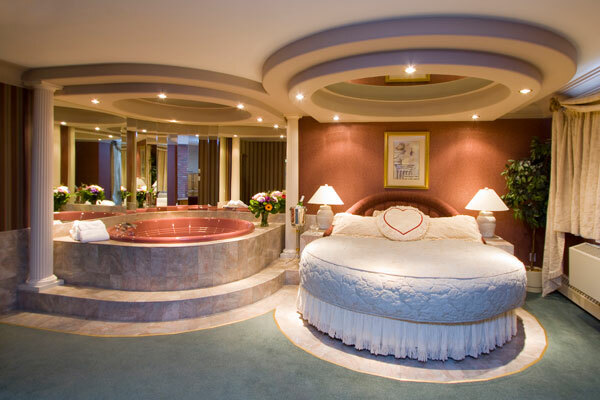 For the ultimate romantic experience, we welcome you to stay in the Woodlands Inn's Romance Suite. 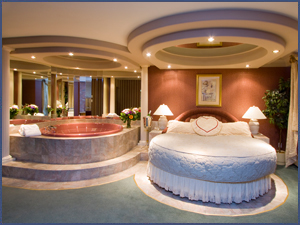 Indulge in luxury while you relax on your round pillow top king bed, or soak with that special someone in your large hot tub. 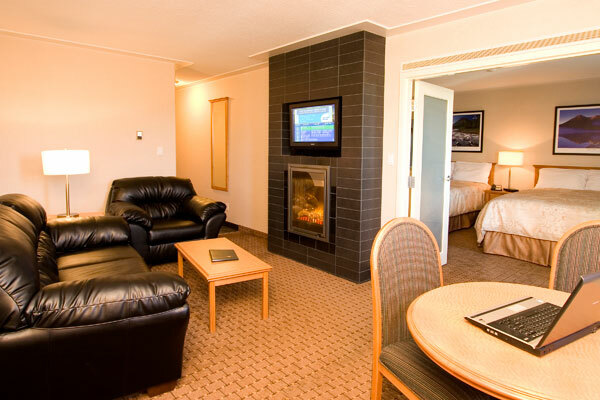 This upgraded suite features a living room with fireplace and intimate décor perfect for a great getaway. Romance packages are available upon request. Kitchen suites are ideal for long term guests or business executives who enjoy the convenience of being able to prepare meals in the hotel. These suites are equipped with all the necessary utensils and appliances, including fridge, stove top, microwave and in-room coffee. 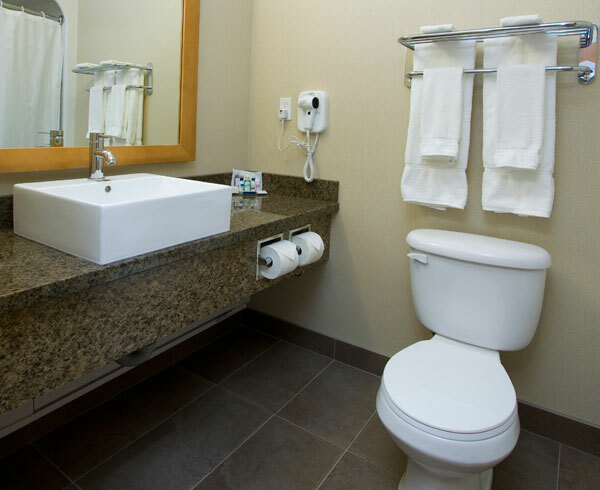 These suites feature a separate bedroom with a Kings sized bed, LCD Flat screen 30” TV, clock radio, complimentary use of bathrobes, second phone, wireless internet, and business desk. Our Barrier Free rooms are very spacious for ease movement and come with 1 Queen size bed, fridge, and microwave, 30” flat screen LCD TV, and in room coffee. The bathroom in the Barrier Free room is quite spacious with a stand up shower that features a bench to sin on and safety bars for assistance. We are excited to offer our guests 71 new extended stay suites, composed of three guest room types, Apartment Suites, King Kitchen Suites and Queen Suites. They have all been designed with the long stay needs of the guest in mind, offering a “Home away from Home” experience. Indulge in the feel of the crisp sheets, plush pillows, and soft linens on our new Restwell President ll pillow top mattresses, along with black-out drapes to ensure a restful sleep. 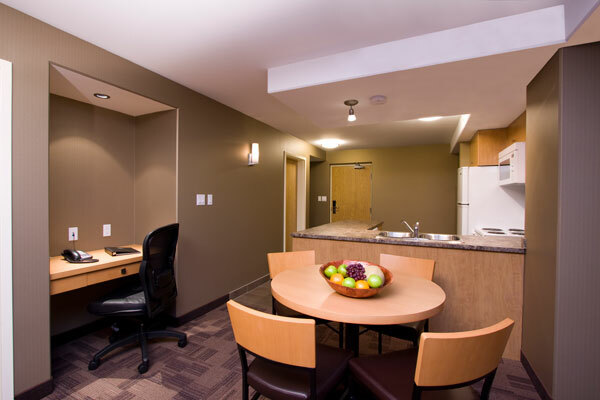 Our extended stay suites have been designed with windows that open, working desks, two 32” LCD flat screen televisions, two internet jacks and two business speaker phones. 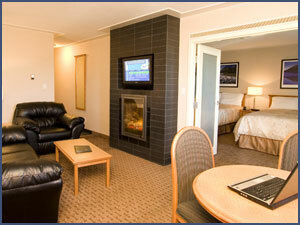 You can also enjoy our complimentary high speed internet, telephone voicemail, local calls and in-room coffee. All suites display exclusive artwork of the Muskwa-Kechika Management Area by award winning photographer, Wayne Sawchuk. Our extravagant Apartment Suites feature a master bedroom appointed with a king size bed, generous closet space, 32” LCD television and fresh air windows. The suites have spacious and luxurious living and dining areas, which are perfectly suited for business or family stays. The ample sized kitchens include a full size refrigerator-freezer, dishwasher and convection microwave. The abundant counter space along with all the necessary accessories are all one would require for daily living or entertaining guests. You will also appreciate the efficient business area with a built-in ergonomic desk, speaker telephone and internet connection. 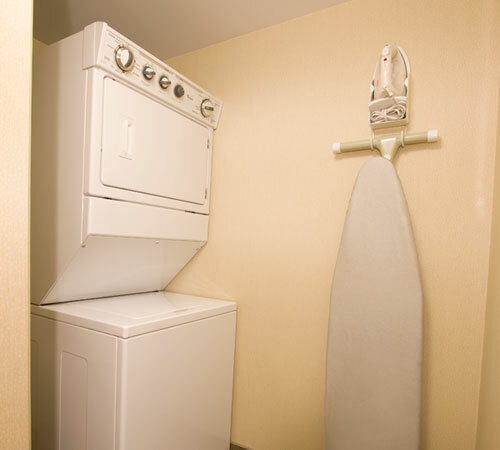 The apartments have ensuite washrooms with large jetted tubs, separate shower, spacious vanity and laundry appliances with iron and ironing board. Our well laid-out and articulately designed apartment suites will meet any guest’s expectations, whether for business or pleasure. Our King Kitchen Suites, designed for corporate travelers and extended stays, feature a separate bedroom with a luxurious king size bed, fresh air windows and a spacious work station. 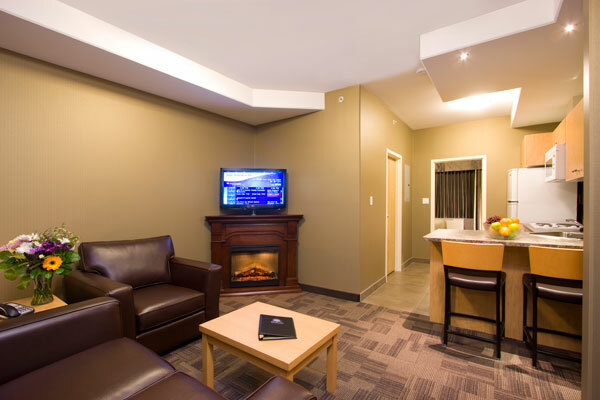 These suites have a fireplace, 32”LCD television, comfortable living area, two speaker telephones and two internet jacks. The kitchens have a full size fridge, dishwasher, a four-burner stove top, microwave and all your cooking utensils. The extended counter space and stools make a casual dining nook. 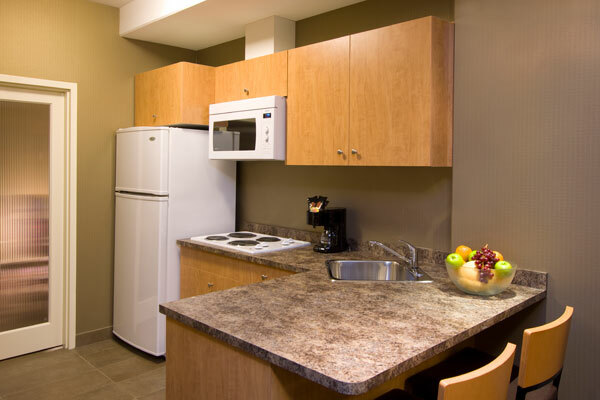 All King Kitchen Suites on the first floor have convenient outdoor access. Select suites also offer a queen sized hide-a-bed for additional flexibility. A King Kitchen Suite on each floor connects to a Queen Suite for the ultimate corporate business arrangement. 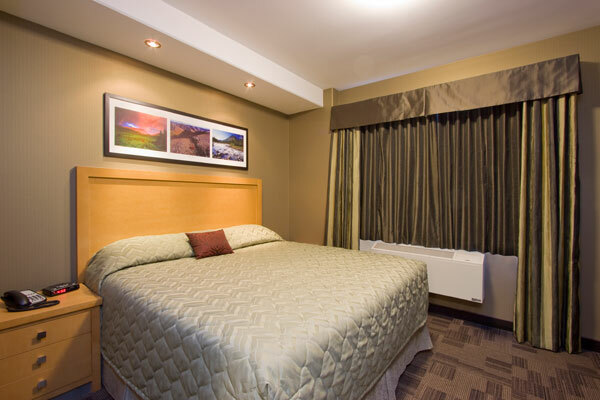 The Queen Suites boast an oversized bedroom with two queen beds and a fresh air window. 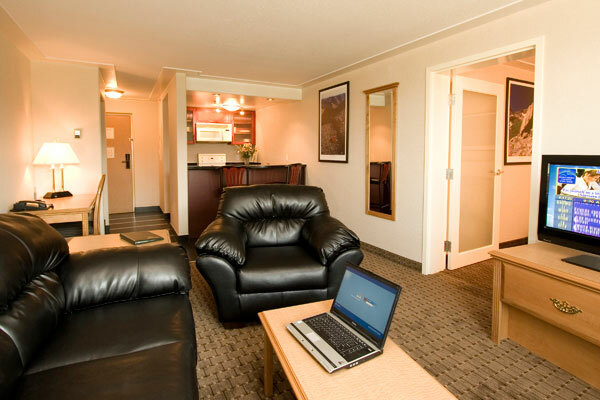 The spacious living area has an oversized work desk perfectly suited for our business travelers. The kitchen convenience centre has a bar sized fridge, microwave and a convenient counter sink area. 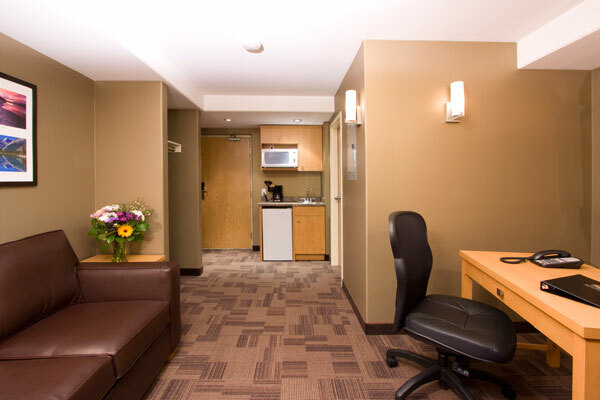 Offering versatility, our Queen Suites connect to an Apartment Suite or King Suite on each floor.